I took the opportunity to create some example boards for apparel options for the Big Game. If you are like me, you don't own any Team Jersey's or Team type spirit wear. That's perfectly o.k. because you can put together a great outfit using standard clothing items that you most likely already have hanging in your closet. I would say here that I don't think it's beneficial to go out & buy anything new if you won't ever wear it again. Take a look at the boards below & see if you can think of items in your closet you can make work. I know you all are going to wear orange & blue though, right?? Mixing a striped shirt with a patterned scarf is a great way to go. All these pieces could easily be worn again in other outfits. A pair of skinny jeans with boots or a flat finish the outfit. I liked adding the brown shoes to the outfit for contrast, but you could also do a Navy, white, or blush colored shoe as well. Don't forget to add some fun jewelry too. I thought I would show some examples for a more relaxed option as well. Again, mixing graphics & patterns is always an easy & interesting way to go. Pairing a graphic tee with a cardigan, hoodie, or jean jacket is easy & comfortable. I liked the white jeans with these options, but you could also do a denim jean, or grey jegging as well. Don't forget to accessorize...it's the icing on the cake, even when you are super casual. Luckily there are a lot of blue & green plaid/flannel options out there right now, which makes this Spirit wear easy. Pair a scarf with a flannel or put a sweater over one &, voila, you have a great outfit. Boyfriend jeans, simple jewlery, & ankle booties top it off. Don't forget that you can mix & match different pieces from the example boards (i.e. wearing a jean jacket with a striped top & scarf, etc). The purpose in showing these example boards is to get you thinking of ways to use what you have. So, put you're thinking cap on & see what you can come up with for the Big Game! These outfits are super cute. I also came up with some outfit options on my blog recently. This is so creative and I love what you chose. I can't say I'm a football fan, but I love me some Cardinals baseball and I'm always looking for ways to show my team spirit! So, I very much enjoyed this post! I'll even root for your Broncos for you! And that striped Modcloth top is great for real life wear, too! I love it! 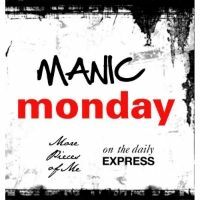 Thanks for sharing this with Manic Monday!